1. Signs of giftedness can often be seen early in a child’s life. Matilda is depicted as an extremely precocious and advanced child, speaking perfectly by 18 months, reading by age 3, and multiplying double-digit numbers in her head by age 5. 2. Giftedness is innate, not taught. One myth about gifted children is that they are the product of pushy parents. This may be true with some high-achieving children, but it is not generally true of gifted kids, whose intellectual ability comes naturally, sometimes even without any parental support. By giving Matilda parents who have absolutely no interest in her abilities or education, Dahl illustrates that some children just have natural intellectual ability. 3. Gifted children love to learn and often have a variety of interests. Because of this, many gifted children love to read. It appeals to their need to constantly learn and take in new information. Before she is even in school, Matilda spends as much time as possible reading. When she starts school, she tells her teacher, Miss Honey, all kinds of interesting facts she learned from reading. “This child, Miss Honey told herself, seems to be interested in everything” (231). 4. Gifted kids often outgrow “children’s” content early. Oftentimes, they view children’s books as overly simplified and opt for more advanced content that provides greater depth and complexity to subject areas. At age four, Matilda reads Great Expectations in one week and thoroughly enjoys it. Though she doesn’t fully understand everything in adult books, she understands enough to appreciate, enjoy, and learn from them. These books also challenge her intellectually in a way that children’s books can’t. 5. Gifted children often have a strong sense of ethics and morality. Matilda’s dad frequently talks about cheating his customers, and Matilda speaks out against his actions. She plays tricks on her parents when they are mean to her in an attempt to achieve balance in an unjust situation. She also gets extremely upset when she is accused of things she did not do. 6. A supportive figure in a gifted child’s life is incredibly important. The librarian who introduces Matilda to fantastic literature and Miss Honey, who encourages Matilda to learn more advanced concepts, keep Matilda challenged and interested in learning. 7. Acceleration is the best way to meet the needs of gifted students. When Matilda skips grades, she works well at the advanced level and is finally academically challenged while still being happy. Miss Honey explains to Matilda, “‘While you were in my class you had nothing to do, nothing to make you struggle. Your fairly enormous brain was going crazy with frustration. It was bubbling and boiling away like mad inside your head. There was tremendous energy bottled up in there with nowhere to go… [Now you are] competing against children more than twice your age and all that mental energy is being used up in class. Your brain is for the first time having to struggle and strive and keep really busy, which is great’” (229-230). 9. Gifted children have a deep, intense focus when interested in a topic. Before Matilda is old enough for school, she spends all day absorbed in books. When she starts school and Miss Honey differentiates her work by giving her a geometry book to read and study, Matilda “very soon became deeply absorbed in the book. She never glanced up once during the entire lesson” (91). This strong focus among gifted children when intellectually stimulated and challenged is common. 10. Gifted kids are still kids. “The nice thing about Matilda was that if you had met her casually and talked to her you would have thought she was a perfectly normal five-and-a-half-year-old child…Unless for some reason you had started a discussion with her about literature or mathematics, you would never have known the extent of her brain-power” (101). 11. Gifted children just need to find friends with whom they can connect. She is well-liked by her classmates and has several friends. Gifted children often form one or two really close friendships, and Matilda develops a meaningful peer relationship with Lavender, who is also bright. 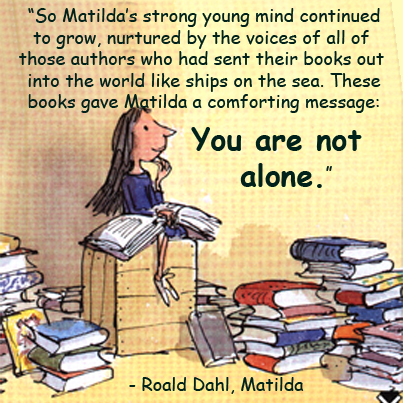 Matilda also has deep social relationships with adults, including Miss Honey and the librarian. She can talk to adults on a more intellectual level than she can with her classmates, which is typical of gifted children. 12. Gifted children are often mature and wise beyond their years. When Miss Honey invites Matilda to her cottage for tea, there are noticeable socio-economic differences. “[Matilda] seemed to be aware of the delicacy of the situation and she was taking great care not to say anything to embarrass her companion” (189). Matilda had never encountered a situation like that before and was not taught how to act in that scenario. However, she looks at the context and understands how to behave. Miss Honey even tells Matilda, “‘Although you look like a child, you are really not a child at all because your mind and your powers of reasoning seem to be fully grown-up’” (195), and Matilda and Miss Honey “talked to each other more or less as equals” (231). What other gifted characters do you love? Please share in the comment section below. This entry was posted in Gifted Information and tagged children's literature, gifted, stories. Bookmark the permalink. 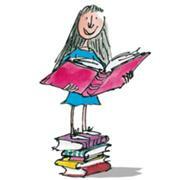 Has your gifted child read ‘Matilda’? Have you? Reblogged this on Jade Rivera. My favorite book! Read it with my students every year. So glad to hear that, Inga! It is a wonderful book. Thanks for stopping by! Thanks for sharing our post on your blog! A good place to find gifted characters in a book is to open A Wrinkle in Time…it is filled with gifted characters. Great suggestion, DiAnna! A Wrinkle in Time is definitely another favorite for many of us. May I link to this from my website? This is really excellent. Who wrote it? Thanks, Shulamit! You may absolutely link to this post. We’d be honored. It was written by Jennifer Kennedy, our Marketing & Communications Coordinator who loves literature as well as the gifted kids we serve at IEA! I loved this the first time I read it and love it even more now. Having been a gifted facilitator for the last 19 years, I have seen every one of these characteristics. Just like Matilda, they don’t fit inside a nice, neat, little box, but they are absolutely incredible people to be around – regardless of age. Thanks for sharing your insights. We agree, Kris! Gifted children are absolutely incredible to be around! We are glad you enjoyed the piece. Thanks for stopping by! I like that they often don’t care what others think of them. They love what they love…no excuses! #8 hits a chord with us – so much of the common core expectation these days is “explain how you got your answer”. My kiddos despise having to explain something when they just know the answer. How can you explain something when you just know it is and you don’t necessarily know how you know? One teacher told us that kiddo 2 probably won’t do very well on state assessments because the test asks for wordy explanations in several subjects. We told the teacher we were just fine if kiddo 2 doesn’t do well because of that. We just don’t see that doing poorly on state assessments will affect kiddo 2’s life or future in any way. I also love Charles Wallace from the Time series by Madeline L’Engle.